What a total joke. That motion carried 7:1 but it was a plaintive cry for someone, anyone, to rescue the city from its many failures – be they criminal or just incompetence. Now we are getting somewhere! We agree with the angst and terror. Attempting to throw the hot potato of the TEE debacle into D.A . Ashley Wright’s lap was never going to work. 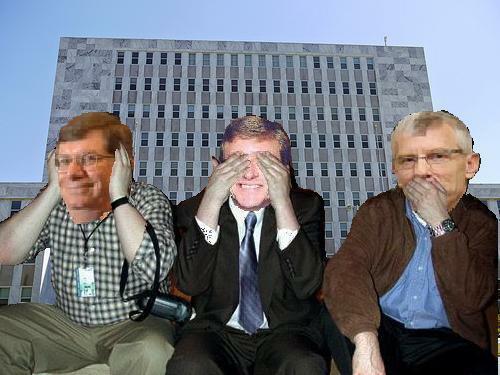 Mayor Deke Copenhaver instructed that we should “present” our evidence to Ms. Wright. He obviously missed a very key point – The evidence is in his possession and custody. We have gotten where we are with slow, diligent investigation of limited facts based upon the laborious Georgia Open Records Act request process. Deke, you have the records. Why not throw all of them open to Augusta Today and CityStink.net? We welcome your new found candor, but you just are not sincere, you are desperate to shake us off the trail. You almost sound as if you are wailing “We are not criminal, we are just Stupid!” You won’t get any argument here. Failure of City Attorneys to advise the commission of Millions of Dollars of liens on property under the $12 million Reynolds Street Parking Deck until after the structure was built. How did this happen when you have engaged special legal counsel? Failure to execute management agreements beforehand, with the result that the commission has a figurative gun to its head – execute a bad agreement or else – so that Commissioners Bowles, Guilfoyle, and Lockett are being forced into arduous hours of work to fix what $1500 an hour worth of “experts” have fouled up! Submitting management agreements for the decks that are UNLIMITED BLANK CHECKS, putting the citizens of Augusta at risk of losing hundreds of thousands of dollars a year. We suspect the same is true of the TEE Center itself. Why are there 15 pages of direct incidences where the commercial terms, as Al Gray calls them, provide monetary benefits to Augusta Riverfront that are vastly more lucrative than the rejected Ampco contract? Why don’t YOU demand answers, as a growing number of savvy commissioners are doing? Buying $1.4 million of kitchen equipment without getting commission approval for changing recorded agreements whereby Augusta Riverfront pays for kitchen equipment while Augusta pays for the building and the kitchen space within the TEE center. Why hasn’t the LLC been billed yet? Where is the $1.4 million of kitchen equipment? Contractor billings show it as work complete, when the facts are that the kitchen was an empty space at the time of the billings back at the end of May! Just this week there was a report about the kitchen equipment being installed. Where are Augusta’s assets? Where was it installed as reported through May? Where is contractually-required documentation for stored equipment? Where is the authority to spend Augusta funds refurbishing Augusta Riverfront LLC’s equipment? Whose equipment is it after the work is done? You celebrated killing a forensic audit that might have answered some of these questions. You threw it over to a D.A. Who you knew could not and would not do anything. Mr. Mayor, why are you engaged in this massive cover-up? To the Commissioners inexplicably remaining in denial – How are you going to remain in this community when the truth comes out – IT WILL – showing you failed in your fiduciary duty to the public? Is claiming utter stupidity – since criminality is off the table – your final defense? I agree with Commissioner Aitken that our government is a laughingstock. You and the Russell Administration are in full panic mode. Some commissioners are now wide awake and the rest have to be getting antsy. Tagged Augusta Commission, Augusta Politics, Lori Davis, TEE Center, TEE Parking Deck Saga.